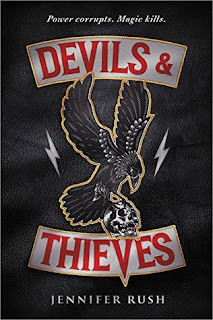 This week, my swoon is from Devils & Thieves by Jennifer Rush! I cut him off. "I should have walked home." I moved past him for the living room. His hand snapped out and grabbed me by the wrist. Heat spread out from his touch, engulfing me, and I wondered if he felt it, too, this volcano that erupted between us whenever we touched. Only some of it had to do with magic, but I was already breathing it in as it snaked out in amber streaks around us, dark and dangerous and pulsing. He hadn't touched me purposefully in a long time. "I miss this," I'd told him that night. "I miss you." He'd glanced at me, his stupidly handsome face painted in the glow of the moon. I recognized that glint in his eyes right away because I felt it, too. I even had a name for it: hunger. "Oh, Jemmie Carmichael," he'd said, and then he kissed me, hard and fast, his hands ghosting over my skin. When he pulled away, just enough to get a breath, lick his already wet lips, I shivered and tangled my fingers in his hair, pulling him back in. 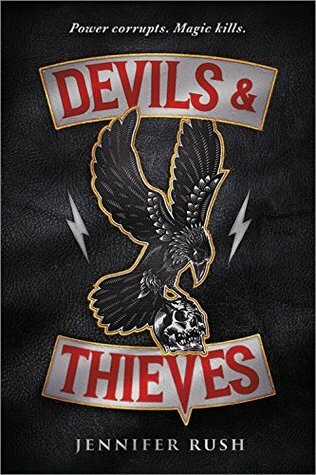 Read my review of Devils & Thieves! I adored this book! It has been a while since Jennifer Rush published a new one, and this one did not disappoint. Check out her Altered trilogy too! Ooooh! I'm really excited about this one! I only ever read Altered and need to finish the series still but I did enjoy her writing a lot and these swoons sound fantastic! Glad to hear it was worth the wait. I love these two paragraphs definitely very swoon worthy!! I hope you enjoy the book! Ooh great picks! This book sounds really good regardless but the swoon makes it sound even better! Oh yeah... I like both of them... The touch after he hasn't touched her in so long!